The swim was in the sea which was bloody cold and choppy! Swimming in a straight line was extremely tough and I think I swallowed at least a gallon of sea water. The bike was a tough course, quite hilly with some steep climbs. It was very well marked but with little support. The run was a 3 lapped course along the sea front so pancake flat! Running past the finish a few times was mentally tough though. The aid stations were filled with the most wonderful volunteers! So kind and encouraging and armed with plenty of jokes to keep you going. I think they were the best part! There was only 1 distance, half Ironman. 1.9km sea swim, 90km bike and then a 21km half marathon to finish. Total distance covered in miles is 70.3 hence the name, Ironman 70.3. As with Ironman events, the price increases periodically and with every payment you have to pay a quite frankly ridiculous 8% active fee. The prices starts at £250 and rises in £25 increments to a final price of £310. With that 8% fee, you could be paying as much as £334.80! In my opinion it is grossly overpriced; yes it nice to cycle on closed roads but considering that there are roughly 2,500 participants and relay participants, it is crazy! The finishers photos are disgustingly expensive hence the low res screenshots from my Mum's iphone! I am so happy and proud of myself for doing it! It was by far the toughest thing I’ve ever done, physically and emotionally. It was great to see so many people I know there too and as I mentioned the volunteers really made the race. The aid stations were brilliant with a lot of choice. 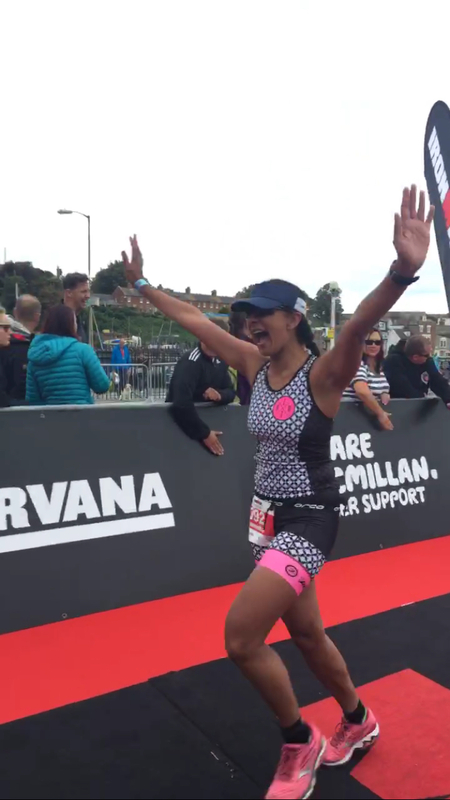 The atmosphere at the finish was amazing, I felt like Beyonce when I came down that finish chute, arms aloft…teeny tiny tear rolling down my face! I think I’d like to do it again……..